Cable testers are handheld, benchtop, or floor-standing electronic devices that measure the electrical and physical properties of cabling. They are used to certify cabling to published standards, and as a troubleshooting tool. Cable testers are also used to test cabling for proprietary interfaces and architectures such FireWire®, a registered trademark of Apple Computer, Inc., and Infiniband®, a registered trademark of the InfiniBand Trade Association. The number of test points is the number of wires, tracings or contact points that a cable tester can test simultaneously. Test resistance is the resistance value of the object being tested. Maximum voltage is the number of volts (V) applied to each test circuit. Maximum current is the number of amperes (A) applied to each test point. 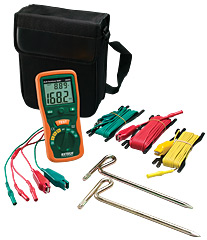 In terms of features, cable testers may include capacitors, diodes, or resistors in the test circuit. Some products can perform high potential or hipot tests to determine conformance with isolation requirements. Others include a trigger for a time domain reflectometer (TDR) view or option. Cable testers are used to certify cabling according to published standards from organizations such as the American National Standards Institute (ANSI), the Electronic Industry Association (EIA), the Telecommunications Industry Association (TIA), the National Fire Protection Association (NFPA), the Canadian Standards Association (CSA), and the International Standards Organization (ISO). Cable testers are used to troubleshoot connectivity problems and determine whether an existing link can support specific network speeds and technologies. These qualification testers are more powerful than verification tools, but do not perform the battery of tests that meet certification requirements. Backplane testers evaluate and record the integrity of printed circuit boards (PCBs) and passive component electronics such as resistors, capacitors, and diodes. Wire harness testers evaluate continuity, resistance, isolation, and other performance factors for multi-strand wire harnesses.